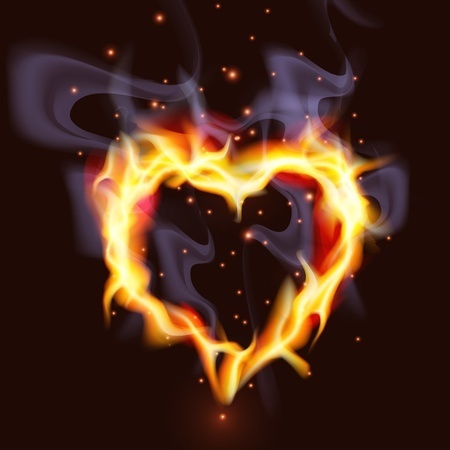 Is your heart on fire? I was on my way to my local train station, in a bit of a hurry as I was slightly late for work. An old lady in many layers of dishevelled clothing stepped into my path. Homeless person I thought, probably wants money, keep going (when you live in a big city for a few years it is usual to develop this kind of resistance). But this time I wasn’t going to get off so lightly. Well that stopped me in my tracks. A less likely plea was hard to imagine. I comforted her and tried to dismiss this outlandish claim but she was insistent. Her heart was burning she explained, it was burning through her clothes. She needed someone to put out the fire before it was too late. She pulled open her coat to show me the burn holes and singeing – which did indeed look as though it was the result of her flaming heart. By this point I was running several thought processes. Sympathy for her predicament, awareness that I was late and getting later and mostly an overwhelming sense of what on earth does one do when asked to deal with someone whose heart is on fire? Nothing in the girl guides (Be Prepared?) had much to offer, nor my extensive education or work experience. I needed an extraordinary solution to this extraordinary problem. Now I was the one silently crying help. As I did so I looked up and an ambulance drove towards me. I had walked this back route to work for years and never seen an ambulance there but lo and behold, right when I needed a solution it loomed into view. And stopped when I flagged it down. The ambulance crew were kind, capable and practical. They explained they weren’t really supposed to pick up off the street like this but they would take her to the outpatients department at the nearest hospital. They thanked me for helping and then they were gone. The street returned to normal. Like it never happened. That was over 20 years ago and it has taken me until now to feel like my on heart was on fire. Years of coping, achieving, getting things done no matter what built up layers of fireproofing around my heart. Over the last few months they have been cracking and peeling away. Some days I feel like my heart is on fire and it is an extraordinary business.